Get Crime Rates for Your Area. 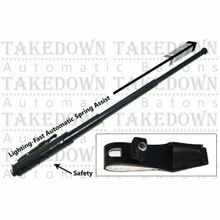 A heavy duty telescopic self defense weapon with spring loaded auto expanding baton sections . Opens instantly and powerfully(!) by pressing the release latch to 19.5 inches long (Total length is 19.5"). A powerful (30 lb) spring is employed to operate the opening of the baton and deploy the sections to operating length. It almost explodes open! 8.5 inches closed length. This baton is heavy, weighing 1 pound and 6 oz. For a positive grip, it has a black rubber-sleeve covered handle. Push button activation and slide-lock safety switch. Complete with heavy-duty black leather holster (with belt loop) for easy carrying. Highly effective self-defense weapon. Note: This item cannot ship to CA, MA, NY, PA, or NJ. This item may only be shipped to the billing address of the purchasing card. In other words, dual addresses are not allowed. You must be of at least 18 years of age to purchase this product. It is the buyers responsibility to check your local laws before buying. The black model (only) is now obtained from Streetwise and has a 1 year warranty. Comes in black finish or chrome silver. Although the product was not exactly what I expected, it WAS exactly as described. When I had an issue, they responded to my emails quickly and multiple times. They even went so far as to make and send a video showing me how to operate my purchase, for which I was very appreciative. The product itself, an expanding police baton, seems to be heavy duty and high quality. If you like our website please click on the +1. We offer the best values in self defense products, non lethal weapons like pepper spray, stun guns, batons, personal alarms, cat keychains as well as home security alarms and child safety products. Sign up to have news and deals delivered to your inbox! About Us - Why Buy from US? Copyright 2001-2019, All Rights Reserved. Defensedevices.com does not warrant that a person may legally purchase, possess, or use specified items offered on this website according to federal, state or local laws. Defensedevices.com assume no responsibility for any illegal use of it's products and reserves the right to refuse service/sale to anyone. By placing an order, the buyer represents that he/she is of legal age, and will use all products lawfully according to federal, state or local laws.